It was an older movie that was impactful for only one reason. Even way back then, a tiny version of me was amazed at just how many stars could be jammed into one movie. I hated it because I was so distracted by all of the stars and had no idea what the movie was about. I still sort of get that same overwhelmed feeling when March rolls around but instead of that pre-teen dread I actually dig it these days. It’s that wild time of year where you find yourself talking to co-workers whose name you can’t remember even though you’ve worked together for years, all because of the NCAA March Madness brackets. It’s the only time the sport is watched on a national scale and madness creeps in. I got to tell you this incarnation of the tournament has been lacking in high drama. Sure, a couple of 12 seeds have knocked off five seeds but that’s almost tradition at this point. It would have been great to see Ja Morant and Murray State knock off Florida State but that storyline was squashed without drama. Duke almost got beat by UCF but didn’t. Kentucky versus Wofford had some spice to it but the Wildcats held on. Liberty gave Virginia Tech a good run but the Hokies slowly put them to sleep. Which is how most of these games have gone. At least Oregon as a twelve seed will be in the Sweet Sixteen. That’s something I guess. On the other foot, every single one, two and three seed are in the Sweet Sixteen. Seems like Cinderella is taking the dance off this year. What’s mad is if the LSU Tigers fight their way into the Final Four without their head coach Will Wade as Mr. Wade is currently wading into a cloudy pool filled with wiretaps and scandal. 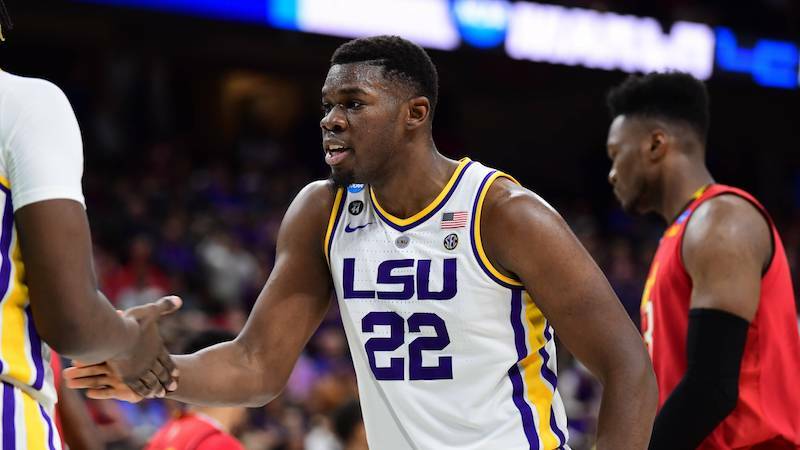 LSU beat Maryland 69-67 in a game that once looked like it would be a blowout but I guess a little March Madness did creep in and Maryland fought all the way back to tie it up late. Right when it felt like the Terrapins could take the Tigers into overtime with mojo on their side Tremont Waters went around the right side for a layup with 1.6 second left to send the Tigers to the Sweet Sixteen for the first time since 2006 when Glen “Big Baby” Davis led the Tigers to the Final Four. Could this team do the same? That would be a touch mad. The Tigers will take on the Michigan State Spartans at 6:09 p.m. this Thursday. I thought the national pundits were mad when the preseason rankings came out with at least four SEC teams in the Top 25. Yet, here we are heading into the Sweet Sixteen with a quarter of the bracket filled with SEC teams. It seems like the years of “Kentucky and everyone else” are long gone as the Wildcats are joined by the Tigers, Auburn and Tennessee. Three of these scratched their way into the round of 16 but the Auburn Tigers sent out a shot heard around the basketball world by lambasting, yes, lambasting the Kansas Jayhawks. Auburn takes on North Carolina this Thursday at 6:29 p.m. in a game that should feature a ton of offense. The UNO Privateers (13-10) have to be a little mad at themselves for letting these weekend series keep slipping through their fingers. The past three weeks the team has rolled into Sundays with a chance for a series win only to see it go south rather quickly. More to the point, the scores of the past three Sunday have gone 9-1, 8-1, 8-2 in a trend no one wants to see. UNO hosts Southern this Tuesday at 6:30 p.m. at Maestri Field. The Green Wave (17-7) continued their winning ways with a sweep of Houston Baptist. Sure, this was a team they were supposed to beat but a sweep is always nice. The team has now won seven of their last eight. The Green Wave continue to get strong performances from Kaleb Roper and Chase Solesky. Roper went 7.2 innings and struck out 12 batters in a 6-2 victory on Friday. Solesky completed the sweep on Sunday, going five innings and striking out nine in a 3-1 win. Those starts sandwiched Keagan Gillies’ most impressive performance of the year as the junior went 6.2 innings with six strikeouts in a game that the Wave would eventually win 3-2 in extra innings. The Green Wave travel to Lafayette tomorrow night to take on the Ragin’ Cajuns at 6:30 p.m.
What’s mad is the New Orleans Saints upcoming draft starting April 25. Well, actually, that’s when everyone else starts picking up draft picks. The Saints, after having traded up for Marcus Davenport last year, will have to wait until the second round on April 26 before they get their first chance to make a pick. Hopefully the Saints will add defensive talent again as it has paid dividends these past three years but at some point they have to start thinking quarterback. I don’t think Drew Brees will retire after next year, especially if it’s another solid campaign, but at some point you have to start thinking about the future.